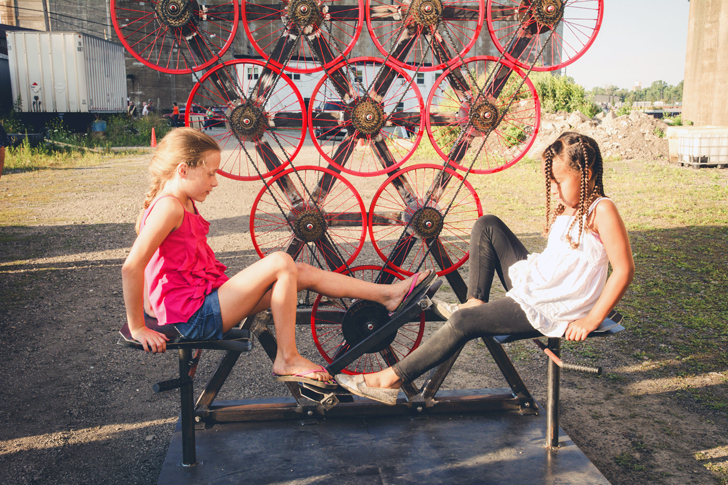 The bright red wheels that make up the CityHEART sculpture are lovingly arranged into a heart shape and interconnected with a steel backing grid. Like a bicycle, each reused bike wheel is connected to a chain, which in turn is connected to another wheel in the arrangement. When in motion, the wheels spin together in unison, making a continuous yet stationary movement. 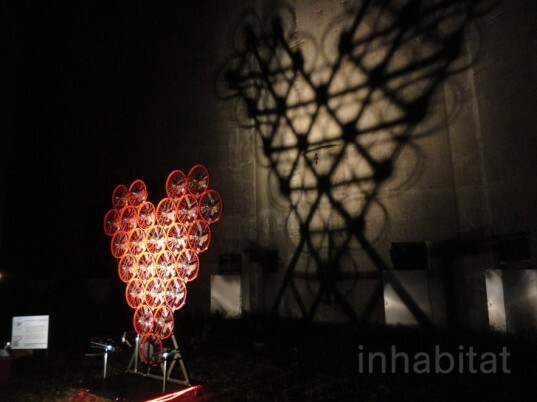 The interactive sculpture invites two lovers or friends to sit facing each other on the repurposed bicycle seats. As one person pedals forward, their partner pedals backward. Together they put the wheels in motion, and the sculpture hums with unified movement. As the wheels are turned faster and faster, the bright red rims and spokes of each bicycle wheel blends into the next, giving the illusion of a solid heart- if only for a moment. To accentuate the sculpture’s dedication to the city of Buffalo, each wheel is engraved with Buffalo, NY and a heart shape in the center. Milbrand has launched an Indiegogo campaign to help CityHEART travel to other venues, inviting lovers and friends in different areas to interact with this wonderful sculpture dedicated to love.